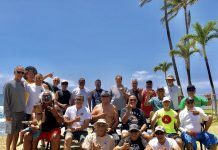 Haleiwa, Oahu/HAWAII — (Thursday, December 6, 2018) – Honolulu’s Ezekiel Lau (HAW) claimed victory today at the World Surf League (WSL) Vans World Cup of Surfing Qualifying Series (QS) 10,000 event, the second stop of the Vans Triple Crown of Surfing, after a dramatic day of competition unfolded in solid 12-15ft. surf at Sunset Beach. 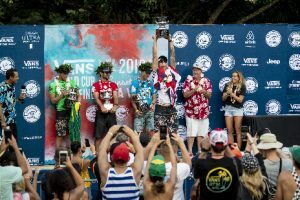 Today’s triumph marks Lau’s second Vans World Cup win (his first in 2013) and a massive achievement for the Hawaiian after defeating an international field of 128 top-ranked athletes, including Jesse Mendes (BRA), who earned runner up, Joan Duru (FRA) in third and Griffin Colapinto (USA) in fourth. Ezekiel Lau of Hawaii places first in the final and wins the 2018 Vans World Cup of Surfing at Sunset Beach, Oahu, Hawaii, USA. 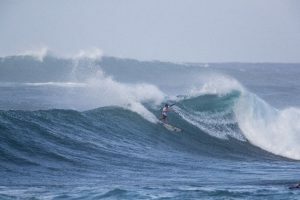 Today’s win now sees Lau in contention for the Vans Triple Crown of Surfing (VTCS) Champion title, which will come down to the final event of the competitive surf season, the Billabong Pipe Masters, with a holding window from December 8 – 20. Lau sits behind Joel Parkinson (AUS) and Mendes respectively, after Parkinson’s exit in Round 4 today opened the door for the race to continue at Pipe. Lau claimed a second Vans World Cup of Surfing title after dominating finals day and climbed up to No. 12 on the QS. His current Championship Tour (CT) standing before the last event of the season at Pipeline virtually qualifies him for a third year on the elite tour, but the Hawaiian has put an incredible effort in the last few QS events as a safety net. Lau was first to take action ten minutes into the 35-minute Final with an average score to start building momentum and take an early lead. While his opponents were struggling to find any big scoring material, the Hawaiian locked in a two-turn combo on a set wave for a 7.33 to solidify his lead. Maybe it was fatigue, or the complicated Sunset lineup still playing with Duru, Mendes and Colapinto’s nerves, but the three surfers couldn’t quite unlock the larger numbers. Mendes managed to find a decent wave and stay on his feet for a 5.30 and second place as Lau walked away with the win, Duru finished third and Colapinto fourth. Mendes’ final day at Sunset was another emotional ride as the Brazilian waited until the very last moments to guarantee his second season among the Top 34. While his first CT effort didn’t quite pan out as expected, a late-season charge on the QS and especially an epic finish with a 5th at the Hawaiian Pro and a runner-up at Sunset cemented his spot among the best in the world. With the completion of the Vans World Cup today, the QS rankings are now final. Surfers in the following Top 11 have officially qualified for the 2019 CT, with Igarashi liberating one spot with his CT ranking. One more spot could also become available if Colapinto maintains his No. 20 rank after the upcoming Billabong Pipe Masters, which would go to QS No. 12 Lau. The surfing world now fixates its attention on the final professional competition of 2018, the Billabong Pipe Masters, which has a holding window from December 8 – 20 and takes place at world-famous Pipeline on Oahu’s North Shore. This event not only determines the Vans Triple Crown of Surfing Champion title for 2018, but also the highly-coveted and hard-earned WSL World Title, which was won last year by local surfer John John Florence (HAW). Heading into the Billabong Pipe Masters, three athletes are in contention for world victory; Gabriel Medina (BRA), Julian Wilson (AUS) and Filipe Toledo (BRA).